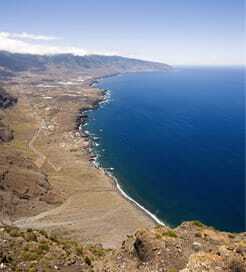 El Hierro is the smallest of the Canary Islands, lying south west of its more well-known neighbors. It has been nicknamed 'Meridian Island' and it is situated in the Atlantic Ocean off the coast of Africa. El Hierro's remote location and cliff-lined shores once earned it the reputation of being the 'island at the end of the world', until Christopher Columbus' famous voyage of 1492 put paid to such claims. The delight of arriving at El Hierro by ferry is not to be missed. Ferry crossings operate most days sailing from Los Cristianos port on the neighboring island of Tenerife to Valverde on El Hierro. Tenerife itself is well connected to the rest of the Canary Islands and mainland Spain as well as featuring two airports so should be used as a base for onward travel to El Hierro. The remoteness of the island has always been one of its most seductive attractions. As is the case with all the Canary Islands, El Hierro is volcanic and the terrain is dramatically mountainous with huge craggy cliffs against which the Atlantic waves crash fiercely. The island has recorded only one volcanic eruption, lasting a month, in 1793; since then the juniper forests, evergreen woodlands, and pines have reclaimed much of the terrain, although in the south of the island there is clear evidence of the volcanic activity in the strange, unworldly rock formations to be found there. El Hierro has much to offer the visitor that is truly unique; so much so that the island was designated by UNESCO as a Biosphere Reserve in 2000, which means that 60% of its territory is protected to preserve its natural and cultural diversity. The translucent waters surrounding the island provide ideal conditions for diving revealing the extraordinary marine life which dwells below them. It is testament to the natural beauty of these shores that each year El Hierro hosts one of Europe’s biggest underwater photography competitions. Restaurants and accommodation are in plentiful supply across the island offering traditionally prepared food and a warm welcome. "Car ferry trip between Playa Blanca and Corralejo with Naviera Armas"
Great service and facilities on board. Relaxing trip sitting on the top deck in the sunshine with stunning views across the channel between Lanzarote and Fuerteventura. Booking with direct ferries was easy, no fuss, loads of times to chose from. On time which is just great! Helpful staff which made the whole experience pretty great! I would recommend using direct ferries. "Armas Ferry - Las Palmas Gran Canaria to Tenerife"
Definitely use this ferry again. 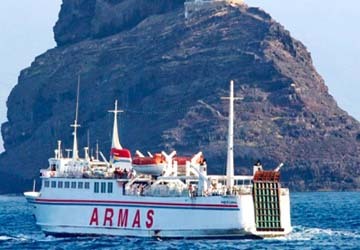 For more information, please visit our Ferries from Tenerife to El Hierro page.